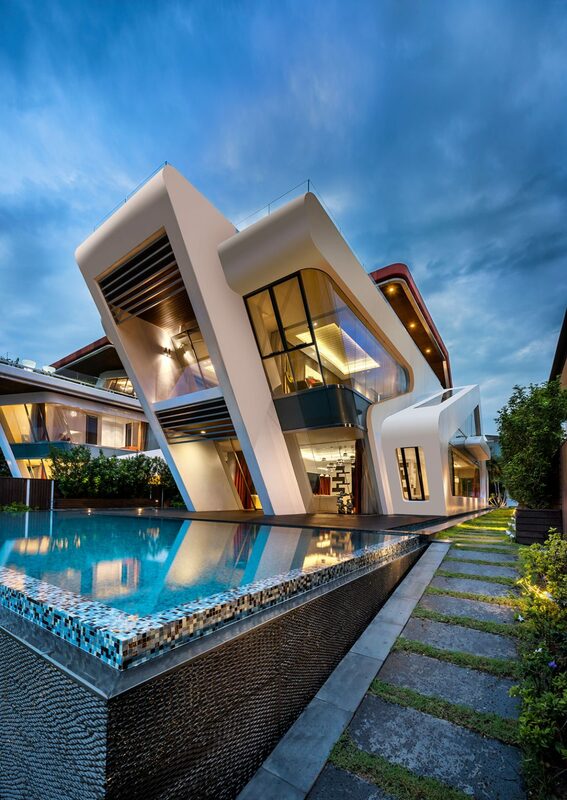 Villa Mistral designed by Mercurio Design Lab is located in the island of Sentosa in Singapore, a mere 15 minute drive from downtown. Named after the seasonal strong, north-westerly wind that blows across the Mediterranean, Mistral is like a sleek cruise ship. Painted in a a hint of metallic white, its structural elements are expressed both externally and internally, simultaneously referencing a boat and communicating the sense of a strong forward thrust. Mistral is over four levels, including a large entertainment room in the basement. Dining, dry kitchen and living are on the entry level, while level two consist of bedrooms and a roof terrace overlooking the canal. The bedrooms on level two, including the master bedroom, are to the side with one at the rear (streetside) with views back to the ocean. With Mistral, the structure is the form. Due to the complexities of the building and difficulties with the contractor, the construction started in 2008 and completed in 2014. THE BEST I’VE EVER SEEN, TOP..!! Last time I was in Singapore was in the 70’s, didn’t see such exciting architecture way back then.